HCPC Compliance Package of the Year. support of blister packaging for shorter duration of use. On October 24, President Trump signed into law the Support for Patients and Communities Act. This law will boost access to addiction treatment and includes many other interventions to mitigate the opioid epidemic, from law enforcement efforts against illicit drugs to combating the overprescription of opioids. For the latter effort, the law formally recognizes unit dose packaging, such as “blister packs” as mentioned by FDA Commissioner Scott Gottleib* and Senator Lamar Alexander in their discussions on the subject. Unit dose packaging can be used to supply initial pain treatment to patients only requiring short term use, limiting the supply to a maximum of seven days to mitigate overuse, which can lead to addiction in some patients in only a few days, and excess supply, which can be diverted and abused by non-patients. The HCPC applauds the efforts of Congress and the FDA to formally recognize proper pharmaceutical packaging as an essential tool in ensuring the safety of patients and their families. For more information on the bill, or to view the text on unit dose packaging, visit Support for Patients and Communities Act and look for Chapter 4, Section 3032. *To see FDA Commissioner Gottlieb’s comments on the use of blisters, listen to his keynote presentation at the October 18 Politico Live event, https://www.politico.com/live-events/2018/10/18/a-tale-of-two-crises-using-tech-and-innovation-to-combat-opioid-abuse-and-diabetes-837728 – His comments on unit of use / blister packaging begins at ~5:45 and he again reiterates the point that the FDA wants to begin the “early implementation of unit dose packaging for the immediate release formulation of drugs, like blister packs . . . we’re going to mandate that the companies make this available.” Then, Dr. Gottlieb reiterates the fact that the FDA is looking to marry evidence based guidelines with blister packs for proper prescribing at 17:24. The Healthcare Compliance Packaging Council (HCPC) is a not-for-profit trade association established in 1990 to promote the many benefits of unit dose packaging — especially the fact that these formats can be designed with compliance-prompting features proven to help people take their medications properly. Simple Drug Packaging Change Could Save Toddlers’ Lives – Pediatric doctors support single dose blister packaging for drugs in order to protect children, reports HealthDay. 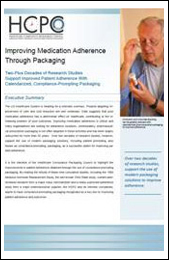 Nov. 2017 study published in American Journal of Managed Care states calendared blister packaging provided an inexpensive method for improving cholesterol medication adherence. HCPC Announces the Winners of the Compliance Package of the Year! Learn how significant physical changes can occur in tablets when distributed in low barrier or multi-use containers in as little as 30 days. Read the HCPC white paper now! 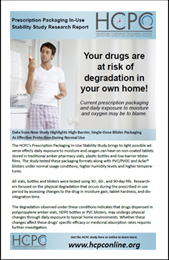 The HCPC works with other non-packaging organizations to promote improved patient safety and health through packaging.